International educators are at the forefront of changes triggered by pathway partnerships and are tasked with evaluating impact and navigating outcomes. NAFSA strives to provide comprehensive and balanced information to help stakeholders develop appropriate campus strategies. 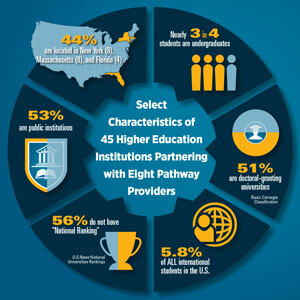 Decisions about pathway partnerships have implications for recruitment and admissions, academic services, student support services and campus leadership. What began as a series of questions focusing on I-17 certification and I-20 issuance as it pertained to the regulatory impact on institutions, has become a broader interest in larger strategic implications of pathways programs for campuses. Review and aggregate publicly available data. A report on Phase One is available for download. Survey practitioners and leaders in the field. The survey was sent to over 2,300 NAFSA members and nonmembers representing the IEL, IEM, and ISSS Knowledge Communities. The questions explored the complexity and diversity of decision-making processes related to third-party pathway partnerships. The survey examined why institutions considered third-party pathway partnerships, to identify the key factors that go into making decisions, and to describe the range of institutional experiences with third-party pathway partnerships. The final report, Landscape of Third-Party Pathway Partnerships in the U.S., is available for immediate download in the NAFSA Shop. PowerPoint slides from Results from NAFSA's Research on Pathway Program in the United States at the 2017 NAFSA Annual Conference & Expo are now available for download. NAFSA will continue to explore this complex topic from multiple perspectives through research and analysis in the near future.